It is easy to become confused. When in Norway we say “scampi”, we actually mean king prawns. Abroad, scampi is the same as Norway lobster (Nephrops norvegicus), which is a near relative of the lobster. HAPPY PRAWNS is producing king prawns – which simply means big shrimp. Neither “shrimp” nor “prawn” is a scientific name, just a popular term for different species that are quite similar. Our king prawns carry the majestic name of Litopenaeus vannamei. In case you were wondering. Scampi is in fact the name given to Norway lobster (Nephrops Norvegicus) and must not be confused with the tropical king prawns we are referring to here. Colloquially we use the name ”scampi” erroneously for king prawns; tiger prawns (Peneaux Monodon) and vannamei (Litopenaeus Vannamei). Who are the people behind Happy Prawns? The people behind Happy Prawns are enthusiasts who dare to think outside the box. Does Happy Prawns use medication when the animals are affected by decease? No. We do not make use of medication – be it antibiotics or other things – ever. May anyone join as investors? In principle, yes, but we would also like investors to also contribute knowledge that may benefit Happy Prawns. When do you plan on starting commercial operations? Our plan is to start commercial operations during February 2018. What are the keys to becoming profitable? Not deviating from the philosophy of sustainable, healthy farming. What do you see as the market for Happy Prawns? Initially, we are targeting aware operators at the top tier of the restaurant and hotel industry. In Norway, of course, but in time worldwide. Are there others currently considering a similar business idea? There are a few players around the world that have business ideas broadly similar to ours. But it is us that have the distinct advantage of being able to use clean Norwegian seawater. What kind of expertise do you currently have in place? Our production management team has broad experience from tropical biotopes, from research into and the adaption of them with respect to optimal quality. Are there any legal or other rocks and shoals? Have you received “thumbs up” from policy makers? Not formally, but those with which we have been in contact, are looking forward to getting to know our plans and our business better. 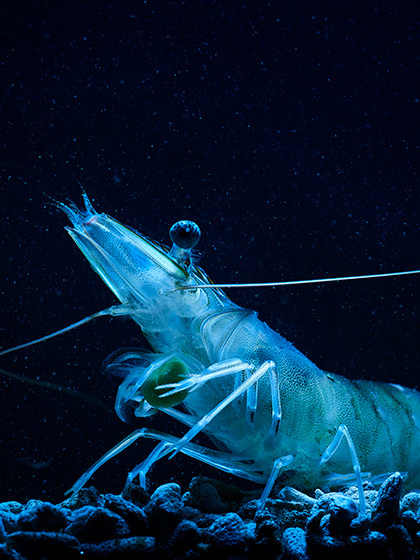 Could Happy Prawns be seen as part of the “green shift”? How does Happy Prawns ensure environmentally friendly operations? We have researched, and are researching, a revolutionary feed for our prawns. We have also developed a tank system that prevents dissemination of disease, and which prevents the release of waste. What is the difference between prawn and scampi? In Norway we use the word scampi for what is really only big shrimp. Abroad, scampi is the same as Norway lobster. Surely, buying king prawns that are harvested in the wild, by trawlers, cannot have a negative environmental impact? Oh yes, trawling for king prawns destroys vulnerable coral reefs and is also a threat to endangered species such as sea turtles. Isn’t painting such a gloomy picture of the scampi industry primarily a trick to get people to buy Norwegian prawns? Certainly not. There is broad documentation of it being a business using child labor, slave like working conditions, extensive use of antibiotics, exhausted soil and massive destruction of mangrove forests. But there already are environmentally marked, ecological king prawns. Isn’t it OK to buy them? No. Investigations have shown that producers do not comply with the major requirements for carrying the mark. Besides, the marking requirements do not include human rights and social problems. “Happy prawns"? So prawns are supposed to have feelings? Animal welfare is more than avoiding visible unhappiness or aversion. A life is a life, and should be treated with respect. This we facilitate with the best possible feed and clean water. In that perspective, we have the world's happiest prawns!